Founded in 1979, Ekmark Electric Company has been providing state-of-the-art services to the Mid-South for 30 years. Ekmark Electric Company has developed a reputation as a highly respected electrical contractor specializing in designing and implementing innovative solutions and technologies for commercial, institutional, financial, retail and industrial industries. As a result, Ekmark Electric Company has wired many of the buildings found throughout the Mid-South. Our professional workmanship is marked by our unwavering commitment to quality and working with our clients, suppliers and employees as a team. Since our inception, the company has focused on the vision of helping our clients respond to the key dynamics that are driving their industry development. This philosophy continues with a substantial amount of our annual budget invested in the training and development of our technicians and staff. Ekmark Electric Company continues to rise to the challenges of providing services for new construction, building improvements and maintenance projects. We have continued to evolve as a company by expanding our offerings. Our Green$mart technology and services has reduced electrical costs and consumption for clients by 50% to 70%. In addition to traditional construction services, Ekmark Electric Company has vast experience and expertise in proactive maintenance, load testing & analysis, major & minor restoration, electrical network reliability and electrical failure prevention. Ekmark Electric Company has the team to accomplish almost any electrical job. We would like the opportunity to discuss how Ekmark Electric Company can meet the needs of your electrical project. Ekmark Electric employees know what it takes to be successful. Our employees believe in teamwork and dedication and understand that being a leader in the industry involves a sense of quality, skill, and craftsmanship. 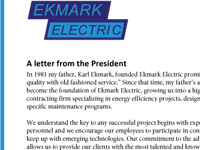 Working at Ekmark Electric provides employee's professional and personal growth opportunities. This is a place where you can make a difference. Electrical work is sometimes strenuous. Electricians may stand for long periods and frequently work on ladders and scaffolds. Their working environment varies, depending on the type of job. Some may work in dusty, dirty, hot, or wet conditions, or in confined areas, ditches, or other uncomfortable places. Employee risk injury from electrical shock, falls, and cuts; to avoid injuries, they must follow strict safety procedures. Some electricians may have to travel to jobsites. Most employees work a standard 40-hour week, although overtime may be required. Those in maintenance and service may work nights or weekends, and be on call. Ekmark Electric is among the very few companies that will pay for your education at no cost to you. We place promising candidates in our Department of Labor Certified Apprenticeship program. You can earn your Journeyman certification while receiving on-the-job training. I wanted to express our sincere gratitude for the assistance and exceptional customer service your company provided to us during the power outage following the storm. It was truly a comfort knowing we had someone to turn to in a difficult time who cared about our business and did what they said they would.